Year 8 students from North Coast Integrated College and mathemagician Andrew Jeffery enjoying the Maths Week Ireland activities on the Coleraine Campus. EVENTS celebrating the 5th annual ‘Maths Week Ireland’ are taking place at the University of Ulster this week. The activities began on Monday at the Magee campus where more than 200 Year 8 pupils from secondary schools in the North West attended a fun filled lecture delivered by Andrew Jeffery. 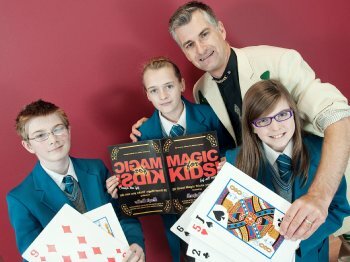 Andrew, also known as the ‘Mathemagician’, used humour, surprise and audience interaction to inspire pupils and enhance their confidence levels in mathematics. Similar events will take place on Thursday 14th October at the Coleraine campus as well as on Friday 15th October on the Jordanstown campus. ‘Maths Week Ireland’ runs from the 9th- 16th October 2010 and involves a variety of public seminars, workshops and competitions. This event was funded through the Access Agreement for the University of Ulster.